Original Rac N Roll 2.0 is a 2018 release, durable competition dance duffel bag with a very strong and durable garment rack and a modern design. It is offered in two sizes of large and medium. The large Rac N Roll 2.0 (AUR2000) dance bag weighs 15 pounds with the measurements of 31 x 14 x 17 inches. And the medium dance bag weighs 10 pounds and measures 28 x 18 x 15 inches. The color and pattern choices include black, blue star, pink star and purple polka dot. These colors and patterns are quite pretty and you can get the one that suits your taste the best. The collapsible garment bag is very sturdy and you can keep a lot of your clothes comfortably on your domestic or overseas travels. You’ll find a few pockets inside and outside, which are very nice to have and will help you keep your stuff organized. It will withstand the very tough conditions thanks to its strengthened frame. 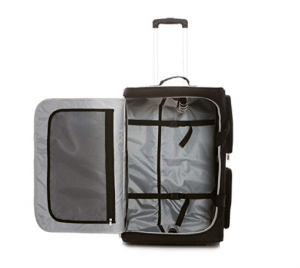 This garment bag doesn’t come with the spinner wheels but skate wheels that also roll very smoothly and easily. These bags don’t weigh a lot and will be quite easy to use by most people. You’ll find the matching straps, zippers and liners inside. As you can see in the photo the bag comes with both a telescoping handle and a larger collapsible hanging rod. You have the D shaped metal rings to help the clothes hangers stay put on your air or land journey. You can hang your costumes on the rod that is held with two collapsible arms. You’ll find two square shaped holes on each side of the bag and these are where they collapse into. 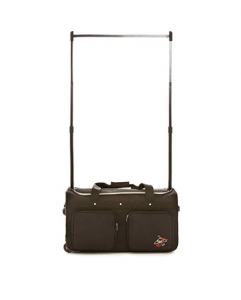 The rack height for the large Rac N Roll is 54 inches, and 48 inches for the medium size garment bag. If you intend to use it to keep your suits and other stuff on your frequent travels you may want to get the medium duffel as the larger version may be too big. The garment rack is very robust and will be great for any men’s suits. There are customers that purchased the medium one for their overseas business travels and they are happy with it. You can fit in 15 to 20 costumes comfortably in the large garment bag, depending on the size. If you encounter any issues with the rods, Rack N Roll will exchange them free of charge. Negative review on Amazon was simply because of the difficulty the customer had with the way the thin rods extended. And it is important that you need to extend the mid section before the last thinner part to prevent the bar from locking. This is not a low cost garment bag but appears to be good bang for the buck, due to its durable construction, very modern and ergonomic design and user-friendly functionality.